Chicago business travel apartments are Premier Luxury Suites alternative for anyone that is looking for something more than a hotel room. We have the affordable and elegant housing options that make your stay in Chicago feel like a second home. The short term apartments we have available are great for anyone staying in Chicago for business, vacation, or as a temporary housing during relocation. Premier Luxury Suites works with our guests to ensure we find the perfect fit for your needs. Chicago business travel apartments are more than just a room with a bed; our options have been professionally decorated and furnished with high-end appointments. People come to Chicago for a variety of reasons from business trips to family vacations. We want everyone to know that there are fabulous Chicago business travel apartments, which you can rent for a short-term vacation or a long-term project. 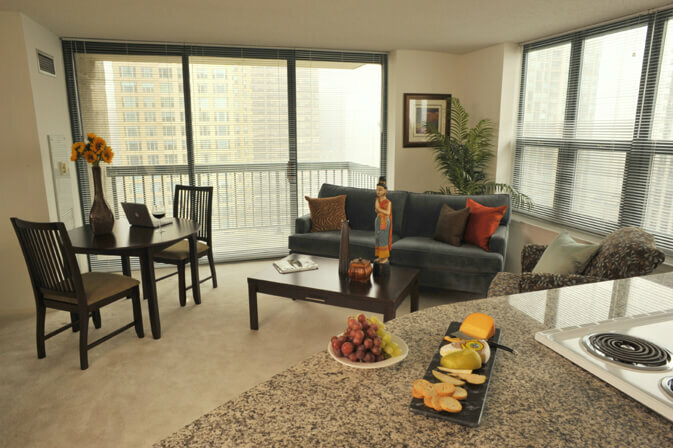 Premier Luxury Suites has 8 different properties available in the heart of Chicago. These are new buildings with some amazing amenities and incredible decor. These properties provide gorgeous temporary housing accommodations. We have the most affordable way to create a home-away-from-home. When you stay in one of our apartments, you will be blown away by our amazing kitchens that offer stainless steel appliances and everything you could want to create a gourmet meal. If cooking is not your thing, you will appreciate the close proximity to all of the best restaurants and hot spots, when you stay at one of our short term Chicago business travel apartments. Premier Luxury Suites ensures that every apartment includes high-end furniture and finishes. From soaking tubs to granite countertops, you will be wowed by everything you get with our accommodations. With our weekly maid service you can spend your off time exploring the city our enjoying the many perks our buildings offer, such as 24-hour fitness centers, pools, and lounges with some great things to keep you entertained. In addition to our furnishings, you will also receive the important items you expect from a quality hotel, such as high-speed internet, a telephone, and cable TV. In addition to Premier Luxury Suites Chicago business travel apartments, we also have some amazing Chicago suburb business travel apartments that get you out of the city, if you prefer a more laid back environment. These buildings are great for families that are relocating to the Chicagoland area with larger apartments designed to fit these needs. We also have pet friendly buildings, so you do not have to leave your furry friends behind, when you have to be away from home. Premier Luxury Suites has the Chicago business travel apartments that travelers appreciate. If you want practical furnishings or opulent accommodations, we can find the perfect solution from our property selection. Premier Luxury Suites is the short-term rental option that our guests rave about. At the heart of every one of our properties is a sense of style and comfort. Please contact us today to take advantage of the affordable Chicago business travel apartments that we have to offer.